Plans to change part of The Hotel Covington agreement with the city and a facade grant for building that will house a new business Downtown top the Covington City Commission agenda for Tuesday night's meeting. The developers of The Hotel Covington, a planned $28 million 116-room boutique hotel inside the former Coppins department store building, will request an extension of its "due diligence" period before formally purchasing the building from the city. The 100-plus year old building was built as a department store and office building and had housed Covington City Hall from 1990 to 2013. The city moved last fall to make way for the hotel development and now is based at a building on Pike Street also owned by the hotel's developers, the Salyers Group. The city is renting its new home. The Salyers Group is awaiting word on New Market Tax Credits, a program that attracts investment capital to low-income communities by permitting individual and corporate investors to receive a tax credit against their Federal income tax return in exchange for making equity investments in specialized financial institutions called Community Development Entities (CDEs), according to a federal website. Locally, the Cincinnati Development Fund serves as a CDE. Those tax credits have yet to be issued in 2014, but Guy van Rooyen, CEO of the Salyers Group has previously expressed optimism that the hotel project would be a beneficiary. The developers appeared before the city commission in January where the terms of the original deal were changed. 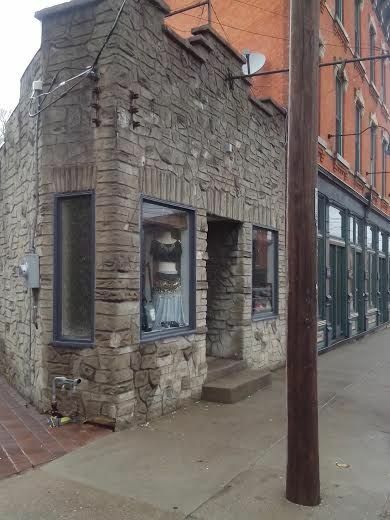 According to a report in The River City News at the time, the city commission voted to sell the Coppins Building for $1 million. The new deal includes provisions that the developers would pay $25,000 and then pay the rest at closing, following sixty days of what Assistant City Manager Larisa Sims called a "due diligence period". During that time, the City and the developers are expected to come to terms on a development agreement and other issues such as parking in the city-owned Center City Parking Garage. The cash up front, instead of waiting twenty years, was an attractive option to City Commissioner Steve Frank who said that the amounts were similar in the long run and that it's better to have the money now. The property at 230 Pike Street will be considered for a facade grant in the amount of $7,221. The building, which resembles a small castle and is owned by former state senator and Kentucky Secretary of Education & Workforce Development Joe Meyer, is the future home of a new business. The Dragon's Hoard specializes in products for Renaissance festivals. The River City News has reached out to the business's owner for the purposes of providing more details on the business at a later date. The Covington Economic Development Program funds the facade grant program. The Emergency Shelter of Northern Kentucky executive director Rachael Winters will provide a recap of the shelter's winter statistics. The shelter is currently in the process of searching for a new home as its current space on Scott Boulevard, a Kenton County-owned building, is slated to become part of the Gateway Community & Technical College urban metro campus. The city said last November that it wants more input on where the shelter plans to relocate. A new transparency policy for the city will receive its second reading and a formal vote. At its last meeting, the city commission heard the first reading of the new ordinance that is part of its ongoing effort to recover from the $793,000 theft by former finance director Bob Due. New jobs are on their way to the River Center towers in the way of Prolocity, an IT firm moving from Boone County. The city commission will consider extending incentives to the growing company. Additionally, the city is expected to endorse continued development of a regional hike and bike trail system, accept the retirement of code enforcement officer Wayne Berry and the retirement of staff accountant Tom Waters, the hiring of Caine Hughes as a staff accountant, and the appointment of Daniel Streicher to the Housing Authority of Covington board of commissioners. The River City News has the most comprehensive coverage of Covington City Hall. Follow RCN on Facebook and Twitter!